This fix-and-forget Slow Cooker Beef Italiano is the perfect choice for a weekday supper, or even a Sunday supper, this time of year! Hearty and satisfying, yet made with a cut of beef that is traditionally lean. It's a beefed up tomato-based pasta sauce everyone will love! Dust off that slow cooker...because Slow Cooker Beef Italiano is a slow cooker beef recipe you are going to want to make. I don't know why I always feel the urge to pull out my slow cooker this time of year. I guess the cooler weather makes me want to cook low and slow! The slow cooker, or crockpot, is a great tool that certainly can be used year round, but there is just something about recipes cooking all day long and filling the house with a delicious aroma that appeals to me this time of year. 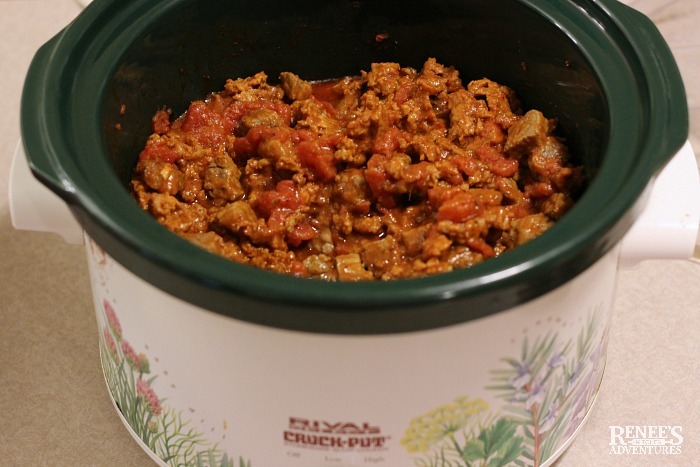 The slow cooker is a great tool for making healthy beef recipes. I love this slow cooker beef recipe for Beef and Broccoli and this Slow Cooker German Style Pot Roast is so comforting this time of year. 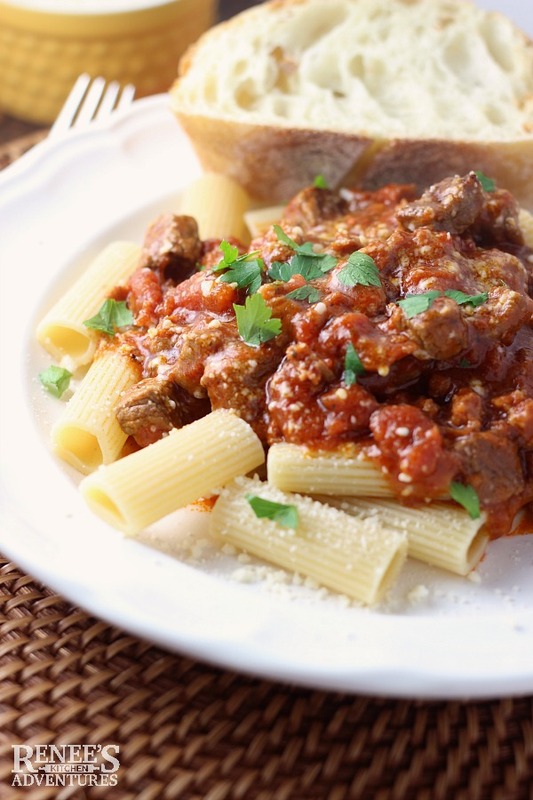 I found this slow cooker beef recipe for Beef Italiano at Certified Angus Beef ® brand's website. Their recipe calls for bottom round roast cubed. But, I used round steaks because they are easier to cut into bite-sized pieces than a whole roast. Round is one of the leaner cuts of beef available, but it cooks up tender and literally melts in your mouth in this recipe. It is also one of the more economical cuts you can buy...making it a great choice for this time of year. I always look for the Certified Angus Beef ® brand on the label when I buy my beef because I know their beef goes through rigorous standards to be sold as Certified Angus Beef ® brand beef and the label means uncompromised quality and flavor. When you prepare this recipe, don't skip getting a good sear on the beef cubes before adding them to the slow cooker. Searing really boosts the beef flavor of the beef. I've made this recipe now several times because it's quick, easy and economical. Plus, my family LOVES it. I also love the versatility of this recipe. I sometimes add other ingredients, such as onions, mushrooms, or Italian sausage to it as well. It's a great base recipe that you can easily customize to your family's tastes. 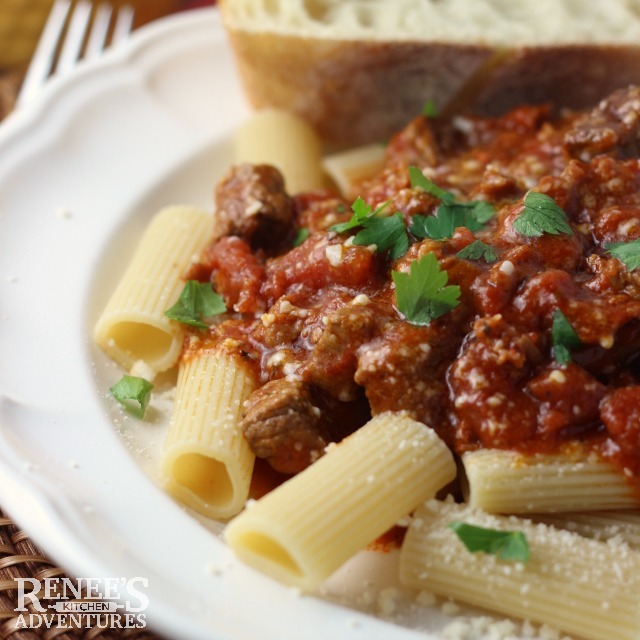 Lean beef is slow cooked with tomatoes and seasonings until it is melt-in-your-mouth tender then served on top of cooked pasta. Heat a large, heavy-heavy bottomed skillet with olive oil over med-high heat until oil begins to shimmer. Add beef cubes, making sure not to over-crowd pan, and brown on all sides. This can be done in batches so as not to overcrowd. In slow cooker, combine the canned tomatoes, tomato paste, flour, Italian seasoning, salt and pepper. Add in the seared beef cubes and stir. Cook on HIGH for 3 hours or on LOW for 7 hours, or until beef is fork tender. Serve over cooked pasta and garnish with grated Parmesan cheese and fresh chopped parsley, if desired. Cook time: 07 hrs. 00 mins. Total time: 7 hrs. 10 mins. 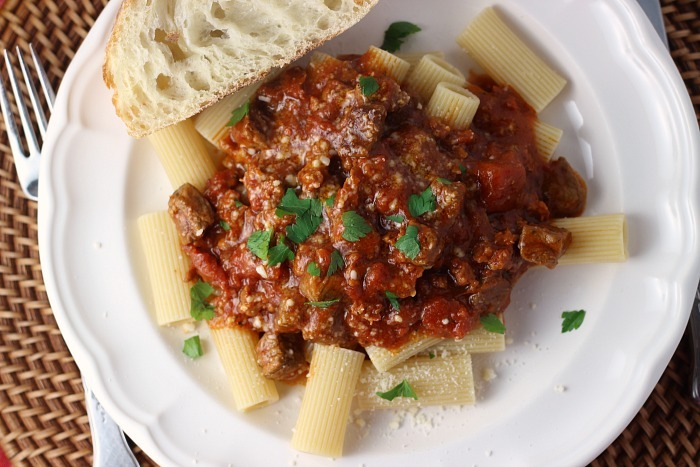 Pin Slow Cooker Beef Italiano to your slow cooker Pinterest boards! Love BEEF? Join the Certified Angus Beef ® Kitchen on FB where you'll find expert tips, advice, recipes and more in a beef loving community made just for you! I am a current ambassador for Certified Angus Beef ® brand. I am being compensated for my work with them. I was not required to write this blog post, but chose to do so. All opinions are mine alone. I used their recipe with permission. Such a simple recipe but oh-so-beautiful. This looks absolutely delicious! Thank you! You really can't go wrong when you start with Certified Angus Beef ® brand. What a great recipe! I'm always looking for more slow-cooker recipes, and we're huge fans of pasta, so this is going on the to-make list asap!